The Periyar hill station in Kerala is a splendid and popular hill station among tourists. It is the perfect haven for anyone who wants to get out of the crowd, noises and pollution of the city life. The Periyar hill station is a perfect destination for relaxation. Situated in the Idukki district of Kerala and in nestled in the Western Ghats, the Periyar hill station is home to vibrant species of wild animals and plants. It is also a paradise for tourists who visit the place and the Spice garden of Kerala. Periyar is a huge wildlife park where you can enjoy the sight of the herds of elephants that playfully roam, swim or bath at the Periyar Lake. This wildlife park is one of the world’s most enthralling wildlife parks. The Periyar hill station lies close to natural plantations and is home to the richest forest, the Periyar Wildlife Sanctuary which is a thick evergreen jungle. 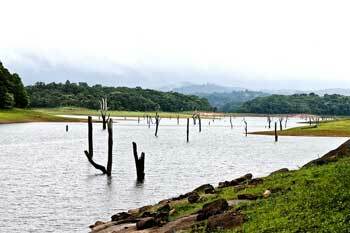 The Mullaiperiyar Dam lies across this sanctuary and adds a spectacular charm to the forest. The many spice and tea plantations make for a wonderful biking path with the aroma of spice wafting in the air. You can enjoy the Periyar River by boating in the river with your family and friends. Exploring the nearby towns, ancient temple and the sensuous forest will make your holiday at Periyar a great one. Periyar Hill station is a serene location in the Idukki district and flaunts about a rich variety of flora and fauna. It is an exciting holiday destination with its spice plantations, jungles and wildlife sanctuary. Periyar also offers you the chance of staying overnight in the jungle and having an exciting stay in tree houses inside the forest. Exploring the Periyar River, the Mullaiperiyar Dam and the wildlife sanctuaries make for a wonderful stay in one of the popular hill stations in Kerala. It is also popular for its numerous wildlife that it houses and the serene hills of the Western Ghats that always give out a welcoming hand to visitors. It provides the perfect destination where families and friends can spend quality time. Periyar has a number resorts, hotels, coffee shops, restaurants, snack kiosks and wine parlors. During your Periyar trip, you should try out the great local cuisine which has an aromatic flavor which is cooked from the fresh and natural spices grown there. Public facilities such as transport, public toilets, police stations and security are available readily in Periyar and in the areas around the hill station.